I’m occasionally asked by students who are getting ready to start lessons what kind of guitar I would recommend for them to get. These are my recommendations for various kinds of guitars: electric, acoustic (both steel and nylon stringed) and kid sized guitars. Since they don’t know how well they will take to the instrument, beginners usually don’t want to make a huge investment for their first guitar. So, all the guitars that I’ve recommended are very affordable. They are low end models from good brands intended for beginners. While they aren’t of a quality that a professional would choose, they are good enough in quality to offer a satisfying playing experience. I advise beginners to get a brand new guitar of some sort. There is nothing wrong with used guitars in principal, but beginners don’t have a frame of reference to tell if a guitar is in good playing condition or not. If you buy new, chances are that the guitar will be in good condition and, if not, you’ll likely have a return policy you can fall back on. Generally stay away from the guitars sold at non-music retail stores like Wal Mart, Target, Sams Club, Kmart, etc, especially First Act guitars. These tend to be of terrible quality to the point where they are hard to play. The last thing a beginner needs is a guitar that is even more difficult than average to play. Instead, go to a music store that specializes in selling instruments. They will have a variety of choices in the price range of the guitars I’m recommending below, and you’ll likely come out with something decent. The links I’ve provided are just for extra information. I’m not collecting any affiliate commissions. 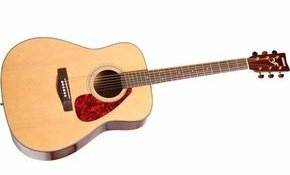 Yamaha generally makes good quality acoustic guitars that are affordable. They tend to play well, have a balanced tone and a nice appearance. This is one of their lower end models, but it’s definitely good enough for someone to use when getting started. A good value for the price. The mahogany body with cedar top will give a nice deep, dark tone that is good for playing classical guitar. One factor to take into consideration for electric guitars is what kind of amp you will be playing through. The amp can have more of an effect on how the guitar sounds than the guitar itself. There are a number of packages available that sell the guitar and amp together. This can be a good way to save some money, so I’ve recommended a package like that. The amp that comes in this package (and others like it) isn’t too inspiring, but if you’re looking for something simple and affordable to get you started it’ll do just fine. If you happen to be willing to spend a little more, I’d recommend getting the guitar from the package by itself and a different amp separately. In this case, a small modeling amp like a Fender Mustang (an amp with a variety of effects and simulations of other amps) can be a lot more fun and versatile. There are some special considerations you should keep in mind when looking for a guitar for your child. One is how big the guitar should be. It should definitely be smaller than full size, but should it be 1/4, 1/2, or 3/4 size? For children aged 7, 8, or 9, I’d recommend a 1/2 sized guitar. For kids in the 10, 11, 12 or even 13 year old range, it’s harder to generalize. Often, a 3/4 sized model will be good. However, a 12 year old boy hitting his growth spurt will need something different from a 12 year old girl not yet in her growth spurt. So, for the guitar size, it might be a good idea to go to a guitar shop with your child and have a sales person make a recommendation that fits them specifically. Another consideration is what type of strings it has. Nylon strings, usually associated with classical guitars, can be much easier on the fingers and a good bet for a young student. Then again, maybe they will want the more contemporary sound of steel strings. For students under 10, nylon strings can be the better way to go. For students over 10, either one can be fine. At that point, their hands are getting a bit stronger and handling steel strings usually isn’t a problem. Finally, the quality of the guitar should be a concern. 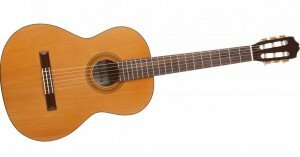 I’ve seen a lot of kid sized guitars that are of horrible quality, to the point where they are really difficult for the young student to play and they break easily. Often, these are the guitars that are found at places like Target, Wal-Mart and Sam’s Club, but you can find some at actual guitar shops too. I’ve been careful to recommend guitars here tha avoid the horrible quality of some other brands while still being very affordable. 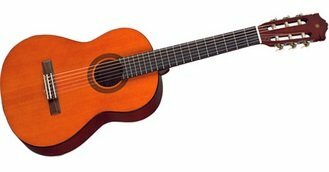 This 1/2 sized classical guitar from Yamaha would be a good choice for an 8 or 9 year old. The nylon strings will be easy on the fingers, and the smaller body will make it easy to sit with while playing. There is also a 3/4 size model available for students who are a little older or taller. If you’d prefer to go with a steel string acoustic guitar, the Yamaha JR1 can be good. They’re solidly built, sound decent considering their smaller size, and they play well. The JR1 is a 1/2 sized guitar, so if you’re looking for a 3/4 sized guitar, have a look at the Yamaha JR2. 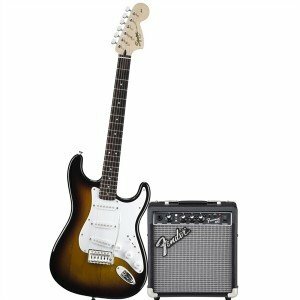 The Squier Mini Strat is the best smaller sized electric guitar that I’ve seen. Unfortunately, there isn’t a package available for these that comes with an amp right now, so that will need to be bought separately. Much like the Yamaha JR1 mentioned above, its solidly built and more like a small version of a real electric guitar rather than some of the more ‘toy guitar’ kid’s electrics out there. Posted in Gear, General Advice, Getting Started and tagged Beginners, Gear.